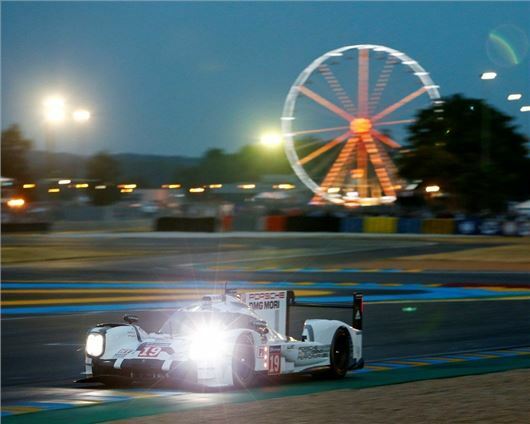 The drive to Le Mans has become something of a pilgrimage for British petrolheads, with thousands making the trip from the UK to northern France to soak up the thrills, spills and atmosphere of the world's most famous 24-hour race. As a result, the highways and byways of northern France are transformed into a rolling classic and supercar road show, with Brits, Germans, Belgians and the Dutch driving there in everything from rusty old Alfa Romeos to the latest Ferraris and Lamborghinis. This year, we got involved in Europe's ultimate road trip by driving a Porsche 911 to the 24-hour race. Our trip started with our alarm clock buzzing at 4am on the Friday before the race weekend. After dragging ourselves out of bed and downing a cup of lukewarm tea, we woke the neighbours with the 911 and rumbled through the leafy suburbs of Cambridge to embark on the two-hour drive to Dover. The ferry is a popular route for enthusiasts, with thousands opting for the sea route because it allows them to talk or laugh at their fellow man and their respective cars. However, despite the banter between the MX-5 owners and Ferrari guys, the crossing was good-natured and filled with tales of speeding tickets and high octane adventures from last year's Le Mans road trip. Then, filled in our weight of bacon rolls and coffee, we roared off the ferry into France and headed south for the 260-mile motorway run to the track. One of the highlights of the trip is the supercar and classic convoys, with drivers using the considerable journey to take in the sights and sounds of their favourite cars. As we drove out of the port of Calais we lined up behind a Ferrari F40, while a Lamborghini Huracan slotted in behind to complete our mini supercar procession. As you might expect, the collection of auto exotica doesn't go unnoticed, with hundreds lining motorway bridges and service stations. Our Porsche 911 - a Carrera 4 GTS Cabrio - didn't go unnoticed either, with its bright red paintwork, flared rear wheel arches and black alloys attracting a small crowd whenever it stopped. The vocal and theatrical flat six was also met with widespread praise by the camera phone welding locals. Rouen represents a turning point for many on the trip to Le Mans, with those eager to arrive staying on the motorway, while the leisurely travellers divert to the A- and B-roads, which follow along the river Seine before heading south on to the country roads that inspired the opening sequence of the Steve McQueen film, Le Mans. We followed the British contingent off the motorway to enjoy some outstanding roads that dart along the Seine before heading through a maze of picturesque villages and small towns. The 911 GTS is extremely powerful, mustering 430PS from its flat six 3.8-litre engine, which proved perfect for the twisty and uneven roads. Yet, despite our spirited driving, it returned an impressive average of 31mpg. As the Porsche roared its way ever closer to Le Mans, we returned to the motorway (the A28) and headed to our lunch spot, the village of Saint-Saturnin. Located to the north west of the Le Mans, Saint-Saturnin hosts the Classic British Welcome; a colourful and fun festival that displays hundreds of cars, with live music and static displays. The event attracts more than 5000 visitors each year and as we approached, we were persuaded by an enthusiastic marshal to display our Porsche alongside other 911s. We happily obliged, leaving our car with the rain, the visitors and a rather wayward Alfetta GTV, which had decided to ignore the marshals and park in the Porsche display area. The Classic British Welcome is a fantastic (and free) event. Each year it hosts a theme to celebrate the history of Le Mans. In 2015, it marked 60 years of the MGA and 80 years since the marque's attempt at the 24 hour race. As a result there was a huge indoor static display, with the centrepiece being a 1972 MG C GT Sebring race car. From Saint-Saturnin, the Le Mans 24 Hours is just a few miles away, although the considerable traffic means this short run will take at least an hour to navigate. However, as we crawled through the traffic to our campsite, we couldn't do anything but smile. The drive to Le Mans is an epic experience, with outstanding cars and friendly people all keen to stop and talk cars. but do you know what the best part of it is? It's the fact that the fun has just started, because there's still a weekend of racing to enjoy.